How to make a custom craft table using Ikea Kallax shelves and a tabletop. This is a DIY table that you can make for your craft room. An easy DIY craft tutorial idea. My craft room is my escape, it’s where I spend a lot of my time creating projects and writing tutorials for you. That means that I need a table that is functional and of course, pretty! Awhile ago I posted about My Craft Room because I was doing some major cleaning and organizing. My craft room was better, but it still seemed cluttered and didn’t have a lot of space for storage and organization. I had been eying this craft table from IkeaHackers.net for a very long time. I pinned it and would drool and dream about it every time I came across it. Over Christmas break my husband was asking me what I wanted for my Birthday (December 30th) and I went straight to this table and said “this”. Later that day we were at Ikea, and before I knew it 3 Kallax boxes were on our cart. Yay! Wonderful! I am contemplating something similar to replace the gateleg base under my cutting table so I will have better storage and a more stable top. I like how you have these fastened -will have to keep this bookmarked! I just wish we had an IKEA closer than 4 hours and a passport checkpoint away. Gorgeous! I love the shape and size. Just perfect. This came out awesome! Very jealous of your craft room. This is so awesome! I’ve been dreaming of one of these! I love the idea of using bookcases. There’s nothing like being organized and having a space to work. Yay for you! This is AWESOME! I am soooo jealous! I would do this if I had space!!! What I would do to have a table like that in my craft room! Thank you for linking up with us on Whimsy Wednesday! We LOVE seeing you and your pretty projects every week. I love your craft table. It is great. I have a link party called Wednesdays Adorned From Above Blog Hop and would love to have you share this and any other posts with everyone. It runs from Wednesday through midnight Sunday. Here is the link to the party. Great table! I love all the storage. Love your new craft table. You are just too creative – you and Paul! Visitng from LiveLaughRowe. Love your table and the stained oak top! I need to make a ‘mini’ version of this for a sewing table. The top was throwing me off – now I know what to do! I love your ‘birthday present’. and what great storage you have now 🙂 I think one of the most important things to remember is to place it in the center of the room so you have access all around. Great job you and your hubby did. Love it! So pretty and it makes doing crafts so much more fun! Nice! I’ve been thinking about making this same desk for my craft room!!! That is pretty awesome! I must do this! Now following! What a great hubby you’ve got there! The table turned out great 🙂 Don’t you just feel more inspired to create things when you have such a great place for it? I put together a sewing/craft room over Thanksgiving and it’s been wonderful 🙂 Thanks for sharing this with us! What a great craft table! I think I’ll have to use that idea whenever I get a craft room. I came over from Adventures of DIY Mom, you have a lovely blog. Oh my goodness! This is an amazing craft room table, my craft room has been pushed into the basement, and I have just this tiny round table to work on, I need to build one of these, lots of storage and work space! Love it! Love it! I want this table too- i just need a craft room! Right now I have an office/guest bedroom/sewing/craft room. Sigh….someday….. Genius! I so wish I had a craft room so I could put one of these together. Yours turned out fabulous!! Awesome table cant wait to make my own. Ah can I borrow your husband? Your new crafting table is fantastic!!!! Love it!! 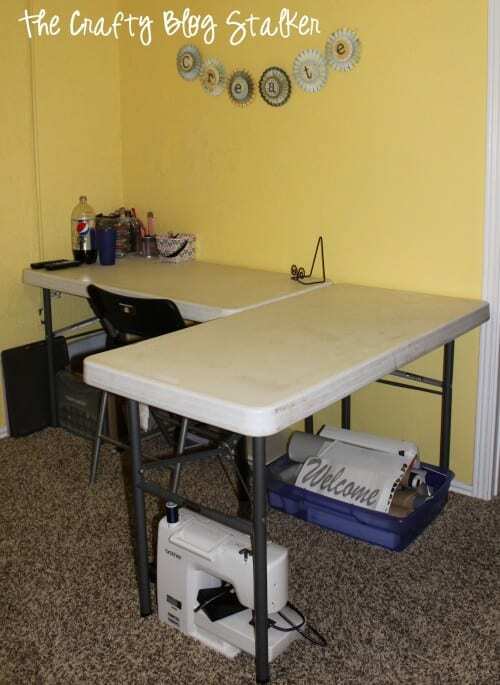 What an awesome work space!I saw this on Sugar Bee Crafts and had to come check it out – very nice!! Love this table, I found it on pinterest. Now you’ve used it a few months would you please tell me whether its a comfortable height to work on standing up? I like to sew and my current table is far too low and I get a sore back but I’m a shorty so want to be able to reach! I do think it is comfortable to stand and work at. but if it did end up being too short for you, you could always add some legs to the shelves to give you a couple more inches. visiting from the Winthrop chronicles party! I saw your thumbnail on Freedom Friday and had to check this out! That desk is totally awesome – I’m so jealous! Do you mind saying what the total cost of the project was? Not at all. I spent just over $200 on the table. Thanks for asking! I’m just more in love with Ikea now! Thanks for sharing! I drew a picture very recently of my dream craft table that looked very similar to this. Thanks for blazing the trail. It looks fabulous and extremely functional! I just found you through Our Delightful Home. I’m your latest follower. You can find me at crazythriftycrafts.blogspot.com. WOW I love what you did with those bookcases!!! I need that badly!!! That turned out beautifully! You just cannot beat IKEA Expedits for creating perfect storage. Wow! What a Great project! I love your craft table! One question, where did you get those ink holders? That’s a great idea too! They are called media stix. They are meant for for dvds or cds. I got mine at Target but you can also find them online. How is the tables durability? I am is worried that the screws will not hold up in the Ikea bookcases since they are card board base. I have had this table for over a year and I still absolutely love it! I even had to take it apart and put it back together when I moved, and it is still super sturdy. Of course it could. The top could be any material you would like. You may just have to find a different way to attach it. This is great!! I’ve seen similar pins on Pinterest but yours looks even simpler. I’m wondering though…..couldn’t you use one of the IKEA desktops or table tops? Or was it even cheaper to buy and stain the oak board? I’m frugal but also lazy since I don’t have a hubster to help with projects. Just thinking of other options……but I’d do the board if I had to. I love this for even a regular home office desk! You could totally use a premade IKEA tabletop and not have to worry about staining. I wanted to stain so that is why I went with that. I absolutely love the idea! I love that you used 3 shelves! Would the table surface be ok if you spilled water or something? Thank you! Since I sealed the wood, water doesn’t hurt the table at all. What type and size screws did you use, if you remember? Thank you! I got bookcases to replace the Ikea cubby bookcases I have and decided to pull the Ikea cubby bookcases I have out and put it under the Ikea tabletop. Just need to drill it together. Also, I noted you used an impact driver, is that necessary? Thank you!! Jocelyn – are asking about the screws that held the L Brackets? My table top is 1/2-inch thick so I used 1/4inch length screws. The biggest thing is you don’t want the screw to poke up through the top of the table top.An impact driver isn’t necessary, my husband was just excited to use his because he had just gotten it as a present. Good luck! I would love for you to send a picture over when your’s is finished. You are going to love it! Making your table this weekend. We picked up the oak plywood from Home Depot today! So excited!! Thanks for the tutorial. That is great Sue! I would love to see a picture when you are finished. Thanks Cindy! I really do love my craft table! I’m jealous! This turned out just awesome! Thank you for sharing with us at the To grandma’s house we go link party last week, you will be featured in tomorrow’s party, hope to see you there! Thank you! I am so glad that you like my craft table. I have really enjoyed having it. Beautiful! My husband is always getting on me because my craft stuff gets a little out of control…little by little i am taking control of it again and would love someday to have a space like this! Thanks Becca! I am so glad that you like this craft table. Beautiful! One of my teaching colleagues just replaced her school desk with something similar! It’s amazing! WOW! Thank you, Jennifer! It is a super functional desk! Your table is amazing! I am choosing your table as my feature at Totally Terrific Tuesday tomorrow. Thank you Sherry! I am so glad you like the table. I have loved having it! I absolutely LOVE this idea! Can’t wait to move into our new home and actually have room for a craft table!! Thanks for the inspiration! Thanks Allison! When you make it I’d love to see pictures! Wow, this looks awesome. I would love to make this but unfortunately, there’s not much space in my house. Hopefully, I’ll great a bigger place to make one of this table. Great DIY! I’m so glad that you like this table! One of the best things about this table is that you can decide the table-top size! Where did you get your paper storage – magazine things? Are they still sturdy now a few years later? Great question Janey! For the 8 1/2×11 paper, I got the holders at ikea. They are sturdy cardboard. For the 12 x 12 paper, those came from Hobby Lobby. I’ve now had both types for several years and they are still holding up great! what are the dimension of the top piece ? The top piece of wood is 72 by 32 inches. Would you mind telling me the size of your craft room? Mine is a little over 8 x11 and was wondering if this would fit? Hi Debbie, I have actually moved from this home where I put the table originally but my guess is about 10 x 10. It wasn’t a very big room. It is now in my new craft room that is larger and I still love it! Do you have a regular chair of adjustable stool for your craft table? I was wondering if it would be tall enough to sit or stand and use an adjustable high back stool.